Welcome to Day 3 of my Fit & Healthy New Year & DietBet Workouts! The Challenge started Sunday, but it isn’t to late to sign up: www.dietbet.com/BenderFitness. There is currently over $6000 in the Jackpot and the Winners (everyone who achieves their weight loss goal) get to split the money! You can find the first workout from this challenge here: Fit & Healthy DietBet Challenge: Day 1: 30-Minute Full Body Home Workout & Fat Burn and workout #2 here: Core, Glutes & Cardio Fat Burn-No Equipment Workouts. Today’s workout utilizes primarily low impact movements, with the exception of jump rope. To make this routine all low impact you can substitute High Knees Marching for the Jump Rope. Also, if you don’t have a jump rope, high knees, burpees or another cardio option can be substituted. Remember, consistency is key to your results. Pair these workouts with a healthy diet and you will see changes in your physique, strength and level of fitness. This workout takes 21-Minutes per round. Aim to get in 30-60 Minutes of exercise today. This round can be completed up to 3X, or you can pair it with cardio of choice. Running, walking, jump rope, etc. I also posted a 10-Minute Per Round Jump Rope workout video below that you can alternate in between rounds to increase the burn. See you soon with the next workout! 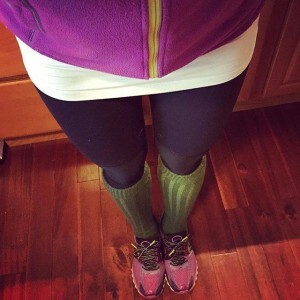 Running in Layers to stay warm in the cold weather! PS Baby Bender is doing well! This weekend I have been focused on running, and getting in some miles. I ran 5-Miles Friday, off Saturday, 5-Miles Sunday, 2-Mile Walk and 1-Mile Run Monday. We have had guests staying with us, and running has been the most efficient way to get in my workouts. Planning to get back to filming this week! Set your timer for 21 Rounds of 10/50. Optional: Pair with 15-30 Minutes Cardio. Just curious….is this an old workout? Your hair is shorter, so it makes me think that it is…. If not, how did the bow lift and the superman feel? When I was in my 2nd trimester I was starting to get nervous about sleeping on my tummy (normal position then). Well, either way, I hope baby Bender is doing well and Mommy too! This is an older workout. I would substitute different exercises for those two now. 🙂 I have been much more tired, and not up to filming as many new workouts lately. Hi Melissa I am just wondering it during the challenge do you schedule a rest day? I did only the first 21min workout yesterday evening. Had to skip the 10min jump rope. In an hour I had to send kiddo to a new tuition place i never been before. That 21min workout was a good one nonetheless. As always it gives intensity & variety. Thank you. Thank you Melissa for all your workouts. You are so motivating.